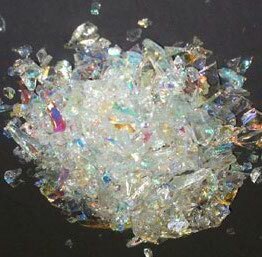 The Dichroic Coated Frit that is currently offerd in 90 and 96 COE is frit that has been purchased specifically to be coated with a Dichroic Coating. This product is not broken up sheets of glass, but actually coated frit. After extensive research CBS has designed a proprietary process that allows the frit to be coated on approximately 80 Percent of the surface area of the glass. Thus, one 8-ounce jar of Dichroic Coated Frit has the equivalent coated surface area of more than one full sheet of flat glass. This ratio of glass to Dichroic Coating is unmatched to any other product available on the market today. Due to this high ratio of Coating versus Glass, the Dichroic Frit responds very differently under heating/hotworking conditions,… a must try for artists looking for a fresh or different look to their work.